Thursday, November 16, 2017 The Mark Twain Shrine Club and Kosair Charities once again partner to present Byron Moss, a student in Adair County Schools, with an Samsung Ipad. He was joined with his teacher and Special Education Director for the school district. Byron was ecstatic and said he was totally surprised. He wants to thank the Shriner’s for the Ipad to be able to use for his classes and school projects. Byron’s mother, Jessica, said that it was great the Shriner’s was able to help and provide her son with the Ipad and wants to send a huge thanks to them and the school district for helping her son. 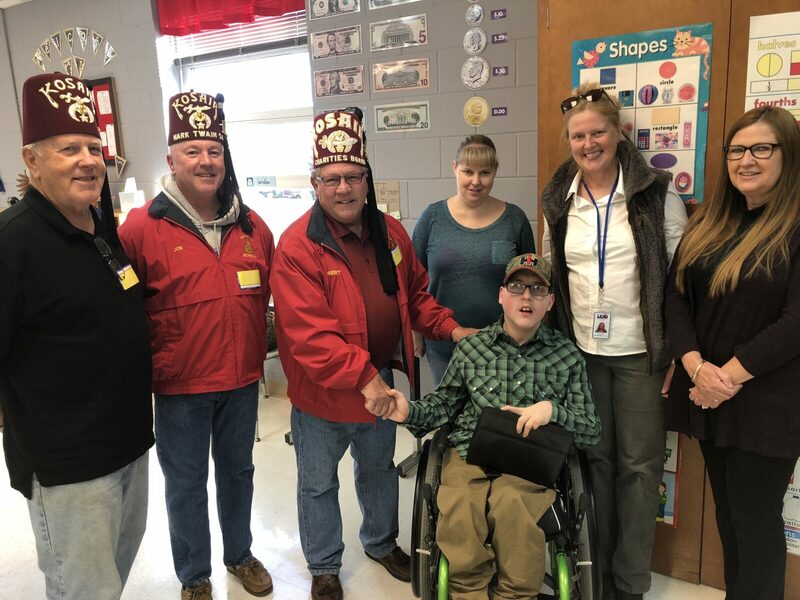 2017-11-16 – Adair County Middle School, 322 General John Adair Drive, Columbia, KY – Photo by Jason Rector Left to Right are Paul Smith, Shriner; Joe Flowers, Shriner; Robert Flowers, Shriner; Byron Moss, Student receiving the donation; Jessica, Byron’s Mother; Sherry Stotts, Teacher and Anita Goode, District Special Education Director.